The central narrative of this paper is the ‘discovery’ by British scientist W H Caldwell that monotremes (platypus and echidna) lay eggs 1. The famous telegram ‘monotremes oviparous, ovum meriblastic’ (monotremes lay eggs of the same sort as reptiles), sent to the British Association for the Advancement of Science meeting in Canada in 1884, put to rest a debate about whether platypus laid eggs or had live young that had raged throughout the century. The story reveals much about the imperial shaping of scientific knowledge. Observers in Australia and Aboriginal informants, who had asserted that platypus laid eggs, had been disbelieved. ‘Discovery’ was reserved for Caldwell, a British scientist of impeccable scientific lineage. This paper takes this well-known story and places it in a broader social context. What were the other scientific questions that drove Caldwell so far north in his collecting? And what was the significance of the cross-cultural frontier in his work? His ‘discovery’ depended upon astonishing support from Aboriginal assistants. The story suggests some new ideas about frontiers in the coalescing of scientific and cross-cultural frontiers in country that was already settled. Shaw named it Platypus anatinus in 1799, and the German anatomist Blumenbach, independently named it Ornithorhynchus paradoxus in 1800.4 A genus of beetles already had been named ‘platypus’, so Blumenbach’s Ornithorhynchus (genus name) was combined with Shaw’s earlier species name, anatinus, to give today’s scientific name Ornithorhynchus anatinus. Why was this animal not ‘mallangong’, (or another Aboriginal name)?5 The kangaroo (cunquroo) had defied description, so an Aboriginal name had been borrowed. The wallaby, koala and others had all similarly needed ‘new’ vernacular names. But the platypus, inexplicably, is known by a lost (Greek) scientific name that belonged first to a beetle. Until the mid-twentieth century ‘duckbill’ (a translation of Ornithorhynchus – literally, bird-nosed) was also popular.6 And the ‘paradoxical’ although lost to priority from the scientific literature stuck in popular consciousness. The scientific and the vernacular names have entangled stories. Whilst in Europe the platypus was dead and a puzzle, in the Australian colonies it was alive, familiar and personable. It was no longer perceived wet, camouflaged as ‘a lump of dirty weeds’, but increasingly its lovely fur was noticed. George Bennett in his Gatherings of a Naturalist in Australia 1860, described the thick fur as ‘a beautiful adaptation to both the burrowing and aquatic habits of the animal’.10 He was reluctant to shoot the animal, trying to observe its behaviour alive.11 The scientific and colonial encounter of the platypus was located in a particular place. The question of whose country yielded up the mystery of the platypus was not determined by the platypus or the people but by another ‘missing link’ in the evolutionary story. One of the last ‘freaks’ of Australian natural history to come to the attention of European science was Ceratodus (Serat-o-dus), the Queensland lungfish (Neoceratodus forsteri).It normally breathes through gills like other fish, but, when the oxygen levels in the water fall, it can rise to the surface and gulp air straight into its lung, an organ that other fish do not possess. The Australian lungfish is unlike lungfish in Africa and South America, in that it can live both underwater and on land. Fish with lungs were known only as fossils in the Northern Hemisphere at the time of the naming of Ceratodus, so the Queensland specimen was immediately dubbed a ‘living fossil’. Ceratodus had an immediate place in the history of ideas. Its relevance to debates about Darwinian evolutionary theory was obvious. Natural selection depended on continuities, but known classes of animals lacked ‘missing links’. Fish, amphibians, reptiles, birds and mammals seemed discrete classes (apart from such absolute anomalies as the paradoxical platypus). Ceratodus, however, as a lung-breathing fish, was clearly intermediate between fish and amphibian. It was not unknown in 1870, only unknown to science. Not only Aboriginal people, but also the Mary River and Wide Bay district settlers ate it, calling it ‘Burnett Salmon’ for its pink flesh. Albert Günther undertook a full anatomical analysis of Ceratodus at the British Museum. Gerard Krefft’s use of the name Ceratodusshowed that he was well aware of the fossil fish of the Northern Hemisphere and recognised that the ‘new’ fish had an ancient lineage. Even so Günther’s anatomical description of the fish as an ‘intermediate form’ between fish and amphibians excited Krefft. In July 1870 (some time before Günther’s paper on the anatomy of the fish was published), he wrote ‘your Ceratodus forsteri if true a greatest discovery …[I am] amazed at it.’15 Although Krefft had given the fish its name, his use of the pronoun ‘your’ suggested that he was giving Günther credit for seeing additional significance in the specimen. I want to leave the hypothetical might-have-beens and return to the reasons for ‘discovering’ Ceratodus in 1870. The limitations of its habitat and the narrowness of its geographical distribution made its discovery by a scientifically-literate observer unlikely. The relevant part of Queensland could hardly be said to be new to European eyes at this time, but it was probably still fair to call it frontier country. Indeed the idea of a continuing frontier in Queensland dies hard. Wide Bay had been surveyed in 1848, and there had been ‘settlement’ up both rivers. Once ‘exploration’ finished, good scientific observers moved on to other pristine sites, leaving the settlement frontier to squatters and adventurers, whose natural history observations were untrained. When squatters at the frontier did make an observation, scientists were slow to believe them. William Forster had described Ceratodus but had been disbelieved by Gerard Krefft until 1870, a point Krefft confessed in his letter to the Sydney Morning Herald, where he attempted to make belated amends to the now important Forster as well as describing the new fish. The difficulty for scientists working in Queensland was, perhaps, to make it clear that their task was morally more worthy than that of frontier-adventurers. They would have been largely sympathetic with the evocation of empire, class and gender portrayed by Nicols. The difference for them was that imperialism was mediated by science, and science was in service to empire. British scientific visitors, in particular, were clearly fearless about taking very large numbers of specimens. But the scientists’ virility was tied to hunting for knowledge rather than hunting for trophies. Such hunting demanded that they tap into the best local knowledge sources, including Aboriginal ones. W H Caldwell had made the scientific expedition internationally famous for this region, and Semon wasted no time in directing his attentions to the area where Caldwell’s collecting had been most successful. I now want to turn to the central story of this scientific frontier, the Ceratodus-driven collecting expeditions of Caldwell and his Aboriginal companions in the 1880s, which resulted in the famous telegram to the British Association about the platypus. It is very difficult to infer the Aboriginal perspectives from Caldwell’s brief account alone. The fact that Semon went to precisely the same area only seven years later, however, and was introduced to Aboriginal collectors by the same squatter allows us to draw on his much fuller account of the Aboriginal people to supplement Caldwell’s remarks. William Hay Caldwell’s Cambridge lineage was impeccable. The department he came from led the world in embryological research. He distanced himself from the ‘early days of Darwinism’ where ‘it was hoped to get a pedigree for every animal’. ‘Now that all biologists are Darwinists,’ he declared to the Royal Society of New South Wales on 17 December 1884, where in fact there were very few Darwinian sympathisers, ‘pedigree-hunting has gone out of fashion’.27 Perhaps he was aware of the lack of sympathy to Darwinian biology in Australia and letting the colonials know they were out of step. He did not bother to write up this extempore talk, leaving it to someone else, in all probability a colonial not sympathetic to Darwinian biology, to report from his notes. Caldwell ultimately published so little that this second-hand account is crucial to gaining an idea of the state of his mind when in Australia. Caldwell’s work in morphology was to observe the minute differences between organic beings at various stages of development, in the belief that the patterns of evolution may be reflected in the patterns of individual development. His teacher at Cambridge, Professor Francis Maitland Balfour, had suggested in 1882 that Caldwell should consider travelling to Australia to work on the development of Ceratodus and ‘the peculiar Australian mammalia’. Balfour, elected to a Fellowship of the Royal Society aged only 27, was taught by Professor Michael Forster. Forster in turn, was taught by T H Huxley, Darwin’s most outspoken advocate. Caldwell benefited from the strong Darwinian lineage of Cambridge, but it was also a burden to him.28 In 1882, Balfour, aged only 31, was killed in a mountaineering accident and a travelling studentship was endowed in his memory. Caldwell, Balfour’s own student, working on a task assigned by Balfour, was the obvious first recipient of an ‘instrument by which [Balfour’s] memory was to reach beyond Cambridge and encompass the world for Darwinian biology’.29 In addition to a personal salary from the Balfour Trust, Caldwell brought with him grants totalling £500 from the Royal Society (of London) towards the cost of equipment. Both Cambridge University and the Royal Society awaited the results of their investments. George Bennett had studied the platypus mostly in New South Wales, and Caldwell, guided by this, determined to start in Sydney on his arrival in Australia in September 1883 and work over the platypus country inland. He had not counted on the skin-hunters. The trade in platypus skins had escalated dramatically in the two or three decades since Bennett’s trips. By late in the nineteenth century, platypus rugs of forty and more pelts were being stitched together.30 ‘I wasted a fortnight trying to obtain information in Sydney as to where the animals were to be found in sufficient numbers for my purpose’.31 By mid-October, Caldwell had given up on platypus, and moved his attention to koala and wallaby, which were just beginning to breed. This material gave Caldwell new information on foetal membranes, and he sent home an account that was published in 1884 in the Quarterly Journal of Microscopal Sciences. It was probably no coincidence that the enterprising Frank turned up on Semon’s coach from Biggendon to Gayndah, and became ‘the first black who crossed my path’. Semon came to have reservations about Frank, however, and ‘refused his services during my second stay in the Burnett.’34 The majority of workers in the new science industry were Aboriginal, because of the particular skills required, but Caldwell reported that he employed some ‘white navvies’ to dig up platypus burrows because the Aboriginal team was reluctant. 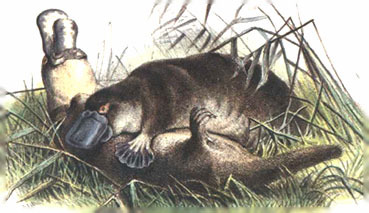 This he described as ‘a lucky chance’.36 To kill a female platypus at the point betweenlaying her twin eggs gave him the crucial information about the stage of development at which the eggs were laid, a stage he described as ‘equal to a 36-hour chick’.37 The timing of the capture of this specimen was absolutely crucial. On 29 August he sent in the telegram ‘Monotremes oviparous, ovum meriblastic’ to a neighbouring station. The telegram was delivered to Professor Archibald Liversidge at the University of Sydney, who in turn sent it to the British Association at Montreal. Less than a week later, on 2 September 1884, Dr William Haacke from the South Australian museum was able to give evidence of egg-laying in monotremes, displaying an egg from an echidna’s pouch at a meeting of the Royal Society of South Australia.38 The Norwegian, Carl Lumholtz also claims to have heard reports of echidna’s eggs, and was in pursuit of them at the time he had to leave Australia, being convinced that ‘the reports I had received from the blacks corresponded with the facts’.39 Caldwell’s ability to tap the very consciously international audience in Canada was critical to his fame. The mystery was ripe for solution, but the drama of the telegram gave Caldwell an edge in the race. Caldwell gained the critical knowledge and the necessary specimens from Aborigines for whom the platypus was not good eating. Neither was it a feature of their art, as it was for the Aborigines of the Kuring-gai Chase area, where a platypus is deeply engraved in a granite rock formation.43 Burnett River Aboriginal people in large numbers assisted not only Caldwell but also Semon in obtaining the long embryological series critical to their science. There are two points to this story: the first is the contingency of scientific discovery. Calwell was seeking Ceratodus when confronted with the solution for the platypus puzzle. The fact that both questions interested the Cambridge embryological school made an opportunistic leap possible, but the coincidence was not really predictable. Caldwell was almost an accidental scientist, empowered and burdened by a large purse and high expectations. When Caldwell returned to Britain in 1887 with a Sydney-born wife, he maintained his Fellowship at Caius College Cambridge only nominally for a couple of years. He published very little and made his way as a successful Scottish paper-manufacturer in the family firm. It was left to others to undertake the anatomical work on his huge collections. Richard Semon in 1891, realising that Caldwell had barely begun the task, decided to make his own trip. By contrast, the German analysed all his specimens and published several important scientific papers as well as his popular book.44 But he too had great difficulties finding Ceratodus roe, because the part of the river he had chosen lacked the weed where the spawn is found. Semon’s published work focused on the monotremes and marsupials, because he had successfully collected developmental series for these. There is no evidence that he observed the stages of growth in the living lungfish that Caldwell did when he bred and displayed a young lungfish to the Royal Society of New South Wales in December 1884. Neither man wrote about lungfish, the reason for the Burnett River destination. Semon’s ‘fear of getting involved in serious difficulties’ and unwillingness to risk the ‘peaceable’ temperament of his Aboriginal team members, drove his decision to settle accounts at the end of the season. This was hardly humane concern for Aboriginal people, but rather a wish to protect the good name of science, to keep science on the civil side of the frontier. There is no doubt that both Caldwell and Semon were well aware that the quality of their science depended on the quality of their relations with the local Aboriginal communities. George Bennett, too, whose relations with his collectors in New South Wales were generally cordial by his own account, was conscious that ‘good Aborigines’ corresponded with good science. Bennett wrote in frustration to Richard Owen about the success of Caldwell, the young professional, in solving in a few months the mystery to which he had devoted half his life. ‘I had only two lazy aborigines’, Bennett complained ‘and Caldwell succeeds …encamped on the banks of the river …with the aid of a large number of aborigines. It is certainly the only way to insure success’.50 Bennett himself was not to blame for coming up with the ‘wrong answer’, only his ‘lazy’ Aboriginals. There is almost an intriguing suggestion here that where the scientific and settler frontiers coincide, the quality of the European observer is second in importance to the quality of Aboriginal assistance. This contradicts Kathleen Dugan’s contention that ‘the system of colonial science left scientists unable to collect biological information from the people best qualified to provide it’.51The system veritably depended upon such people. The problem was the credibility of the brokers of the information, the settler naturalists. European science before Caldwell disbelieved Aboriginal and settler Australian voices alike. Settler Australian naturalists were deeply discomfited to find that their observations were worth no more than an Aboriginal’s. The fact that Caldwell fresh from Cambridge with his well-paid Aboriginal team established the ‘right answer’ without assistance from colonial scientists added to settler anxiety. This anxiety is manifest in the strategy of blaming Aboriginal assistants for wrong answers. Settler naturalists wanted to be with civilisation, on the side of empire and new knowledge, not with the colony, in error, and degenerating. During the past fortnight we have received several telegrams from London, respecting the late meeting of the British Association, at Montreal, and in some of them references are made to suggestions that a future meeting be held in Australia. As far as one can judge, the idea seems to have been thrown out when Professor Moselle, FRS, announced Mr Caldwell’s discovery of the oviparous nature of the platypus and Australian porcupine. The news seems to have created or rather reawakened interest in the peculiarities of Australian Natural History, and on the spur of the moment some of the more enthusiastic members appear to have proposed that a subsequent meeting of the British Association should be held in Australia. The text of this letter was also reproduced in the Proceedings of the first meeting of the Australasian Association for the Advancement of Science (AAAS), held in Sydney in 1888. It was the first salvo in Liversidge’s energetic campaign to bring the British Association to Australia, a campaign that was finally successful some thirty years later.52 Perhaps the telegram’s most immediate contribution was to draw evolutionist Walter Baldwin Spencer to Australia. Spencer, whilst in Britain in 1884, wrote the note in Nature about the significance of Caldwell’s work. Three years later he took up the Chair in Biology at the University of Melbourne.53 Liversidge and Spencer both went on to be very significant in scientific affairs in Australia, especially the AAAS. But they also moved Australian science to focus on other things. The platypus frontier had closed. George Bennett’s “Platypus twins”, 1860. “Curious platypus”, from Harriet Ritvo’s collection The Platypus and the Mermaid and other Figments of the Classifying Imagination, Cambridge Mass, Harvard University Press, 1997. “Splash”, Robert Eadie’s 1930s platypus – from Charles Barrett, The Platypus, Melbourne, Robertson and Mullins, 1944. Libby Robin is a Research Fellow in the Centre for Resource and Environmental Studies at the Australian National University, Canberra. She is author of Defending the Little Desert: The Rise of Ecological Consciousness in Australia(Melbourne University Press, 1998) and co-editor ofEcology and Empire: Environmental History of Settler Societies (Keele University Press, 1997). She is currently completing a history of ornithology in Australia, entitledThe Flight of the Emu (forthcoming 2001). Libby’s PhD is in History and Philosophy of Science, and she has worked as a Curator in the National Museum of Australia as well as in various universities. The National Museum of Australia, due to open in Canberra in March 2001, will include material about platypuses and their social history. 1 Elements of this argument will appear in a longer paper entitled ‘The Platypus Frontier: Eggs, Aborigines and Empire in nineteenth-century Queensland’ in Deborah Rose and Richard Davis (eds) Dislocating the frontier: essaying the mystique of the Australian outback.2001 (forthcoming). The longer paper focuses more closely on the nature of the frontiers. I am grateful to Deborah Rose and Richard Davis for comments on this paper. 4 George Shaw, The Naturalist’s Miscellany: or Coloured Figures of Natural Objects Drawn and Described Immediately from Nature, Vol 10, June 1799 Fascicle, near plates 385 and 386. Johann Blumenbach, Abbildungen, Vol 5, Part 41, April 1800. 5 George Bennett noted that Mallangongand Tambreet are used in ‘the Yas, Murrumbidgee, and Tumat countries’ and ‘Tohunbuck‘ at Goomburra, Warwick near Darling Downs in Gatherings of a Naturalist in Australasia,Milson’s Point, Currawong Facsimile Edition, 1982 [Original edition, London, 1860] p. 97. Neither Richard Semon nor W H Caldwell record the Burnett River Aboriginal name for platypus. 6 The over-determined ‘Duck-billed platypus’ is still popular in Britain. 8 J F Meckel had dissected mammary glands in 1824, but it was George Bennett’s account of ‘actual observation that milk is secreted from it’ (letter to Owen, 4 February 1833) that was the basis for Owen’s account of the glands to the Zoological Society of London in 1834. See Elizabeth Dalton Newland ‘Dr George Bennett and Sir Richard Owen: A Case Study of Early Australian Science’ in R.W. Home and S G Kohlstedt (eds.) International Science and National Scientific Identity, pp 55-74, esp. p. 68. 13 Gerard Krefft, Sydney Morning Herald, 18 January 1870, p. 65, col. 5, Fig. 1-3; Krefft also published the description in the Proceedings of the Zoological Society of London, 1870, pp. 221-4, but the SMHwas first. 14 Ronald Strahan, Rare and Curious Specimens, Sydney, The Australian Museum, 1979, p. 29. 15 AMA 48: Krefft to Günther 13 July 1870. This is the only sentence in English in the letter. 16 D J Mulvaney and J H Calaby, ‘So Much that is New’: Baldwin Spencer 1860-1929, Melbourne, Melbourne University Press, 1984, p. 146. 17 Strahan, Rare and Curious Specimens, pp 33-34. George Bennett and W B Clarke resigned from the Museum over this. 18 G P Whitley and Martha Rutledge, ‘Johann Ludwig (Louis) Gerard Krefft (1830-1881)’ in Douglas Pike (ed) Australian Dictionary of Biography, Vol 5 K-Q, 1851-1890, Melbourne, Melbourne University Press, 1974, pp. 42-4. 19 Quoted in J W McCarty, ‘Gold rushes’, in Graeme Davison, John Hirst and Stuart Macintyre (eds. ), The Oxford Companion to Australian History, Melbourne, Oxford University Press, 1998, p. 284. 21 Nicols, Wild Life and Adventure, p. vii. 22 Ibid, p. 347-8. The place of this platypus is probably south-west Queensland, not the Gympie area, but it is unclear, and because it is all ‘fiction’, conflation of places and events is possible. On the hunting ethic, see John MacKenzie, The Empire of Nature: Hunting, conservation and British imperialism, Manchester, Manchester University Press, 1988, esp. pp 25-53. 24 Harriet Ritvo, The Animal Estate: the English and other creatures in the Victorian Age, Cambridge, Mass: Harvard University Press, 1987, p. 267. 25 Richard Semon, In the Australian Bush and on the coast of the Coral Sea. Being the Experiences and Observations of a Naturalist in Australia, New Guinea and the Moluccas. London: Macmillan & Co. 1899, p. 2. 27 W H Caldwell, ‘On the development of the Monotremes and Ceratodus’, Proceedings of the Royal Society of New South Wales, 18, 1884, pp 117-22. 28 Roy MacLeod, ‘Embryology and Empire: The Balfour Students and the Quest for Intermediate Forms in the Laboratory of the Pacific’, in MacLeod and Philip Rehbock (eds), Darwin’s Laboratory: Evolutionary Thought and Natural History in the Pacific, Honolulu, University of Hawaii Press, 1994, pp 140-165. 29 Ibidp. 148. MacLeod records that £8,446 was subscribed to the scholarship. 30 See Barrett, The Platypus,p. 17-19. The National Historic Collection of the National Museum of Australia has such a rug. 39 Carl Lumholtz, Among Cannibals: An Account of four years travels in Australia and of Camp Life with the Aborigines of Queensland, London, John Murray, 1889, p. 329. Lumholtz was aware of Caldwell’s work, so there may be some hindsight in this observation. 43 Barrett, The Platypus, rock art illustration. 44 Semon’s studies are published in F. Romer (ed.) Monotremate und Marsupialia, Jena: Gustav Fischer 1894.The National Library of Australia copy is the one from the library of the SS Discovery of the Antarctic Expedition of 1901-4. The adventures of Semon thus went far south with other adventurers. 50 Bennett to Owen 1888, quoted in Gruber, ‘Does the Platypus lay Eggs?’ p. 51. 51 Dugan, ‘The Zoological Exploration of the Australian Region’, p. 92. 52 Appendix to President’s Address, Proceedings AAAS, Sydney, 1888, p. 15. The BAAS came to Australia finally in 1914. 53‘Walter Baldwin Spencer, ‘The eggs of monotremes’. Nature, 31, 1884, pp 132-5; See also Mulvaney and Calaby, ‘So Much that is New’, esp. pp.143-5.